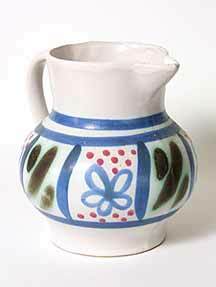 Blue Buchan jug - 6" (152 mm) high. In 1867 the pottery of T Tough & Co in Portobello, Edinburgh, was bought by Alexander Buchan and Thomas Murray. They traded as Murray and Buchan, changing to A W Buchan & Co in 1882 when Murray dropped out of the partnership. They moved to larger premises in Crieff, Perthshire. In the early days the bread-and-butter lines were stoneware storage vessels and stylish containers of various kinds. It was not until the end of the nineteenth century that decorative domestic wares were produced; slip decorated during the first half of the twentieth century and painted or printed in the second. The mark used from 1949 onwards is a thistle design with the words BUCHAN Portobello Scotland in the thistle motif and FINEST STONEWARE beneath. The Portobello mark was still used after the move to Crieff. Other marks include 'Portovase' and 'Senolith' or 'Cenolith'. Buchan ceased trading in 2000.